Filed to: Kono Light Novel ga Sugoi!Filed to: Kono Light Novel ga Sugoi! The yearly results of the annual Light Novel ranking publication are finally out. Thanks to an early filtration of the cover we already knew that Yahari Ore no Seishun Love Come wa Machigatteiru (OregaIru) a.k.a My Teem Romantic Comedy SNAFU was the overall winner this year, but the biggest surprise the 2015 edition of Kono Light Novel ga Sugoi! brings is the dethroning of 5-time Best Female Character winner Misaka Mikoto. 15) Danshi Koukousei de Urekko Light Novel Sakka wo Shiteiru keredo, Toshishita no Classmate de Seiyuu no Onnanoko ni Kubi wo Shimerareteiru. 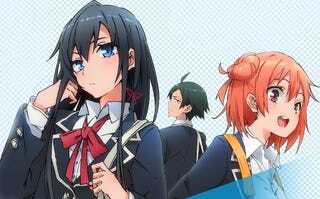 As in past years Oregairu, Sword Art Online and To Aru Majutsu no Index series are in very high spots in the ranking and as it was the case last year the overall winner is once again High School comedy My Teen Romantic Comedy SNAFU (Oregairu) and thanks to its popularity we're receiving a second season scheduled for Spring 2015. Other things to note is how The Irregular Anime didn't boost the novel popularity and we all know why ;). Also of note is the lovely name of the 15th spot which is as long as they come and who more or less can be translated as I'm A High School Boy and a Successful Light Novel Author, But I'm Being Strangled By A Female Classmate Who's A Voice Actress And Is Younger Than Me. I mean come on! seems like the author decided to put the summary of the series in the title. Also seems like Amagi is not popular. And see how Anime does help? Sinon makes the 7th spot even if she doesn't appear at all after the Caliber arc in the novel. Of course there are Oregairu,.SAO and To Aru characters everywhere. And once again Oregairu takes the top spot, this time thanks to his illustrator Ponkan8 and Kiyotaka Haimura is once again very highly ranked, as does SAO illustrator ABEC. Shocking Truth! 3) Kono Koi to, Sono Mirai. 5) Danshi Koukousei de Urekko Light Novel Sakka wo Shiteiru keredo, Toshishita no Classmate de Seiyuu no Onnanoko ni Kubi wo Shimerareteiru. So there you have it, Oregairu takes all the top spots this time. Are you excited about season two as much as I do? As a bonus have this illustration of Kaori Korimoto (the one on the left side) and Iroha Isshiki (The one on the right side) the new characters announced for the second season of SNAFU. The will be voiced by Ayane Sakura and Haruka Tomatsu. you may remember mentions of Kaori on the first season as the girl who rejected Hachiman, making him the cynic he is today.